No, I’m not talking about brothels. The term promiscuous architecture was once used to describe buildings displaying an indiscriminate mingling of elements without any discernible order. In 1865 the term was used to reference many of the houses around the Whycocomagh area of Cape Breton and is indicative of a kind of snobbery that has long existed in house descriptions. 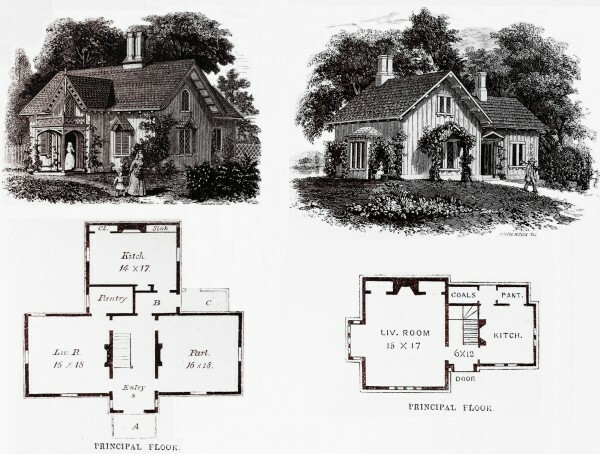 It may not be surprising that the term was used by that rigid Protestant organ known as the Presbyterian Witness but the bias against “ordinary” or “hybrid” houses lingered well into the twentieth century as evidenced by Inventory Site Forms that humourously evaluated historic properties based on how well they exemplified a particular style. A house that displays no apparent formalized elements of style or is a hodgepodge of two or more styles typically has not commanded the respect of a strict Romanesque or an unadulterated Queen Anne. Today, we have dropped the promiscuous reference in favour of that somewhat more redeeming term vernacular. Apart from the interesting contention that strict rules of architecture were commonly ignored in this part of the world, the writer’s use of the word, favours expresses a subtle yet respectful assessment admirably suited to just about any hybrid, mixed, or perhaps even vernacular example of architecture. My point is there is no need to diminish a historic property by labelling it as a poor or incomplete example of xyz architecture. Look at it this way – if a university degree features a major area of study and a minor – the minor in no way diminishes the major. In a similar way, a house might favour Italianate influences and exhibit Second Empire influences. Above: A Gothic style house built in 1877 gets a Craftsman style verandah with sweeping umbrage in the second or third decade of the 20th century. Our vernacular architecture, of which not only Whycocomagh but the entire province has its share, has gained greater appreciation in recent decades. So too, have houses of hybrid forms and details. Hybrids, in some cases, have the ability to communicate fascinating stories of transition as owners felt compelled to modify their homes for various reasons including keeping up with the latest style. T. S. Arthur’s short story, Bay Window and Mansard Roof, from 1873 relates a tale of envy in which one neighbour covets another’s “updated” exterior and ultimately succumbs to the unbearable temptation to have the same Second Empire features added to his own house. The great value of built heritage is the stories that are communicated and it is often the case that the promiscuous tell more remarkable and compelling stories than the pure. Think about it… but please do not mistake this for an analogy promoting reckless social behavior.